Hi, I've been up all night trying to finalize my print book cover to send off to IngramSpark. Well, as I found out just the day before yesterday, they need the color space to be CMYK, US Web Coated (SWOP) v. 2. Fine. Today I got that installed in the Color Management section of GIMP. Or should I say, of the GIMPs . .. Here's where it gets interesting. I've upgraded to GIMP 2.10.4 on my Windows 10 PC, but I don't like the dark gray workspace (or whatever it's called). So on my Windows 7 touchscreen laptop, I kept 2.8.22, and that's what I've been using to put together this cover. As you can see from the attachment, it has a LOT of blue. When I proofed it on the PC with GIMP 2.10, most of the colors were out of gamut, including the blacks. Just awful. But when I tried it on the laptop with GIMP 2.8, proofing just shows the blues a little faded, but nothing's out of gamut at all. So what's making the difference? Is it the different version of GIMP I have on each computer? Or is the out-of-gamut the fault of my PC's monitor? Or is my laptop monitor lying to me? I need the file I send IngramSpark to be printable the first time, because they charge $25 for every correction. Don't want to be on the hook for that! So any help is appreciated, the more simply-put, the better. BTW, I saved the file at a smaller size so the forum would stop throwing it back. The best advice is, if CMYK is required, start and finish using CMYK. The attached is comparing the CMYK with the original RGB and those yellows (gold) & white (silver?) are going to be most of the problem. 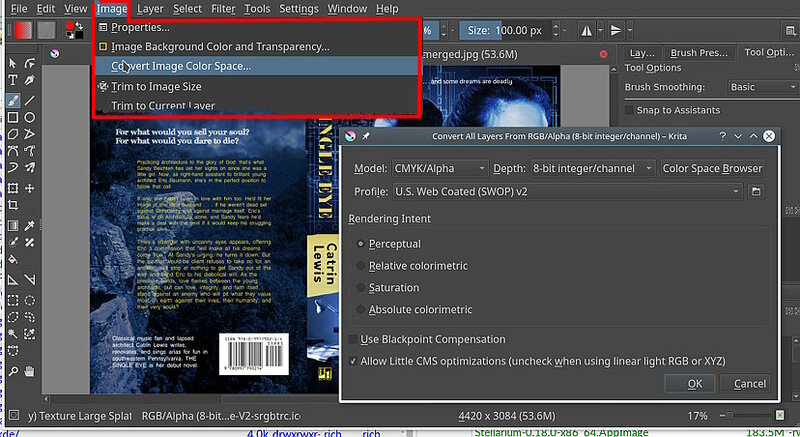 You do not give OS but if linux or Win and Gimp 2.10.x then worth looking at the Cyan application, can be used as a Gimp plugin. Thanks for the comparison image. 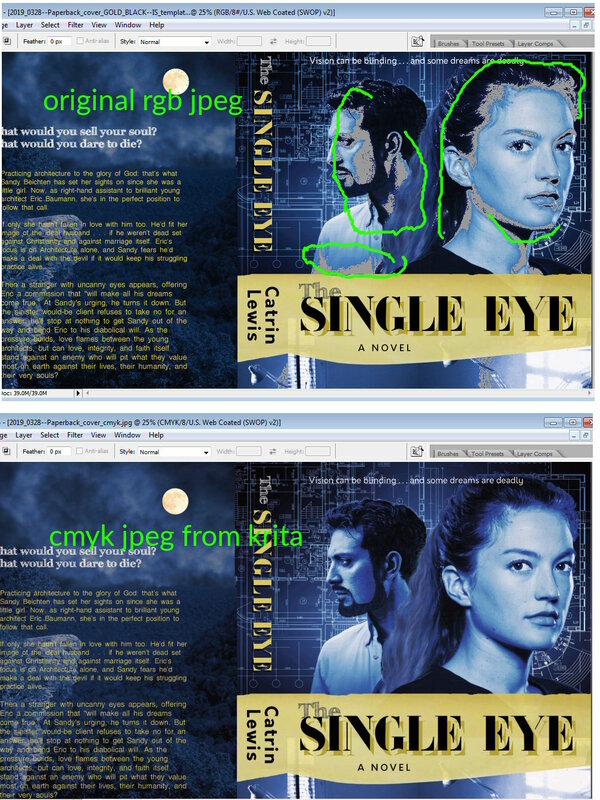 Going by that (though you don't state it outright), the way-out-of-gamut problem is with my PC's monitor, and I won't have to fool around with the RBG file too much to get something acceptable in CMYK. You mention the yellow and white: The ironic thing is that on that bad proof the yellows and whites were the only colors left. All the blues and even the blacks showed up in out-of-gamut magenta. I've heard of Krita and I'll download it and see if it will do the trick. Is there anything in particular I need to know about it? The essential thing is that the final file has to be in PDF, and not just any PDF, but PDF/X-1a:2001 or PDF/X-3:2002. But I'll climb that hill when I get to it. Gimp does show just about everything out-of-gamut and so does Krita. I can never quite believe that indication, so borrowed a PS and this shows their interpretation. Top the RGB jpeg and bottom the CMYK jpeg from a Krita colourspace conversion. 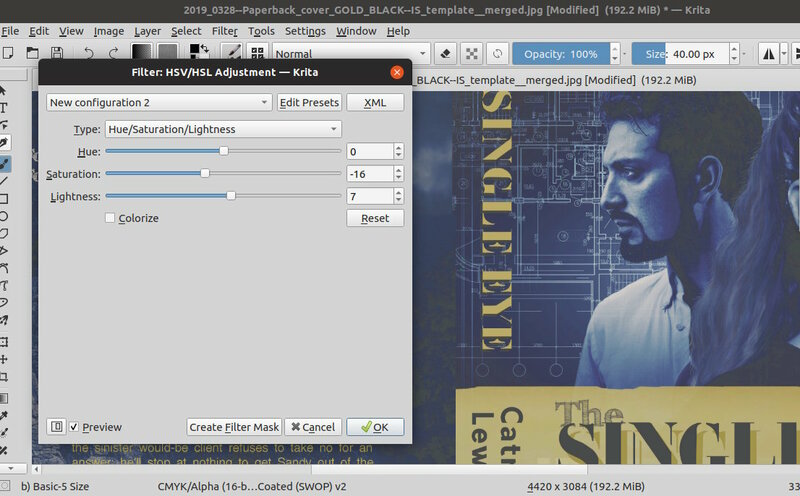 To me that look more credible than Gimp which is purely a RGB editor. Bright colors subdued as mentioned before. 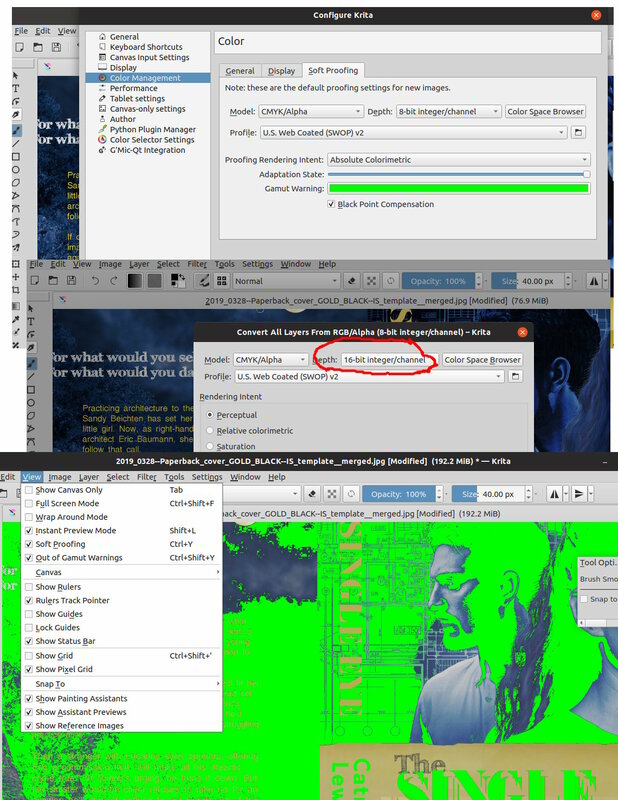 Krita does show out-of-gamut, screenshots of the setup. I advise promoting to 16 bit, if you want to adjust the image. A re-export will reduce to 8 bit, that is the jpeg standard. Need a CMYK PDF for the printer. Only one (free) application and that is Scribus. The professionals will have a color profiled monitor. The equipment for that costs and not easy to set up. Some hints here: https://www.cambridgeincolour.com/color-management-printing.htm Most laptop users have their screen far too bright, have a look there for a simple adjustment.